Pimple is a result of a blockage of the skin's pore. Inside the pore are sebaceous glands that produce sticky sebum. Acne lesions are commonly referred to as pimples. 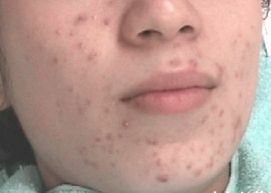 Acne develops because of impairments of the functioning of skin glands, notably blocked follicles. 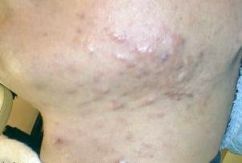 Acne is clinically considered a skin disease. When we were at the age of adolescence, most of us experienced having pimples on the face. It is said to be a symbol of adolescence or puberty. Although pimples or acne appear at any age, especially when we suffer from severe stress, constipation, or unbalanced diet, the number of pimples are countable as 1, 2, 3……19, 20. And it will simply disappear soon, usually when you reach the age of maturity. However, you will wonder when the pimples are scattered around your face, back, chest, arms, and even to your feet. 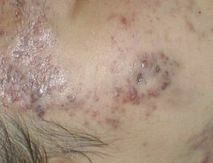 You visit a dermatologist when the pimples get worse like below photos, won't you? Pimples or acne might not be just a simple symbol of youth. We recommend you to consult your dermatologist in early stage before it gets worse. If your doctor says that it's just a simple pimple or acne, then, it will disappear soon, and there's nothing to worry about. However, if the dermatologist says that it is something more than just a simple pimple, then, what will he recommend you to do or what are you going to do? Both of you will just shake heads left and right wandering. For sure, all of us experienced pimples especially during teens or twenties. It will be really strange if you did not have even a single pimple and they disappear without any trace within two to three weeks. However, due to a certain reason, like a change in constitution, skin quality, environment, and disorder of the autonomous nervous system, it could lead to severe and long-term acne occurrence. If left untreated at this time of state, it may lead to an advance stage of acne that is difficult to treat and creates pimple marks or scars. Most of us knew that it is important to improve the skin condition and have a proper blood circulation in order to prevent this. Usually, if the acne scar appears on the skin, the cells that synthesize collagen actively cure the scar. In the case of old age, the percentage solubility and the soluble/insoluble collagen ratio decreases, and fibers in collagen tend to separate, thus, leaving bruises caused by acne. Wrinkled skin is another sign of weakening collagen. Although, we knew these facts scientifically and clinically, no one can really identify the definite cause and its treatment for severe pimples as shown on the photos above. 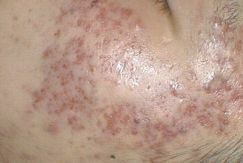 It is because such severe acne is caused by the negative energy. At this point, to simply eradicate the negative energy is to use the PYRO-ENERGEN machine. 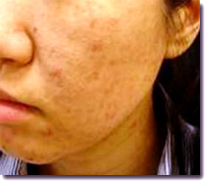 Of course, you do not or you cannot believe that such severe acne or pimple is caused by the negative energy. If you leave it thinking that it is just simple pimples, then it may later become worse. Skin diseases like lupus and herpes are similar diseases caused by pollutants, bacteria, fungi, viruses, or combinations. Pimple you have might be caused by the negative energy, then, later you may notice that it's not a simple pimple and you may have difficulties finding the immediate cure. If you find pimples on your skin, use PYRO-ENERGEN before it's too late. Preventive measures for worsening of pimples—what is your idea? You may have better idea to heal pimple.